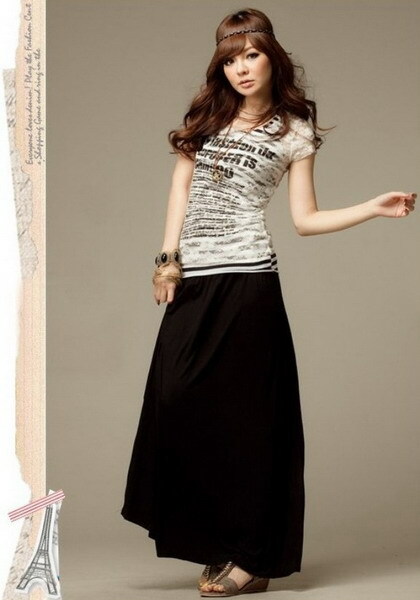 Ladies fashion can never be complete without stylish long skirt. Here's look at some of the most popular ones. When worn long, they can be manipulated to highlight your positive features and set the pulses racing without showing too much skin. From the boardroom to the local food spa, long skirts are tailored to suit any occasion. Various fabrics, patterns and cuts have flooded the market to accentuate the feminity of woman. They can be embellished with sequins, lace and beads and look ultra-fab when teamed with sandals. No fashion week would ever be complete without fashionable long skirts. This garment has been an integral part of ladies fashion and continues to be popular till date. Denims, being versatile in nature, when crafted into sophisticated long skirt can truly boost the way woman feels, whether at work or with friends. It can be paired with simple tee on lazy day or combined with strappy, layered top for night out at the disc. Must in every woman's wardrobe, the length can be played up in various ways. Long denim skirt can be fitted to the ankles mixed with stretch blend for hot and sultry look. If you think it is time to make splash in many colors and flowing fabrics...the gypsy skirt is designed for you. Reminiscent of the '60s and '70s look, the fashion industry has implemented various ways to transform these gypsy skirts into what we see on the fashion runways today. This sensuous garment is generally worn by women (sometimes even by men) mainly on pristine, white beaches! Easy to wear, this skirt needs only to be wrapped around and comprises single piece of fabric. Generally found in bright, floral batik prints you can find staggering range in terms of colors, fabrics and prints. Worn especially, throughout Thailand, Philippines and Indonesia, the sarong has found its way from the beaches to the regular evening attire and has also remained to be an ultimate and casual style statement. simple white top will aid in bringing out the beauty of this long skirt. The long skirt is timeless creation and it would probably never go out of fashion, just like the classic blue denim jeans. Touch of fur, tiny slit some sequins, huge motifs, zany prints - Take your pick and bring out the woman in you!